Use the parking brake to keep the vehicle stationary when parked. When the parking brake is applied, you can manually or automatically release it. The electric parking brake can be applied any time the vehicle has battery, no matter which position the ignition switch*1 is in. 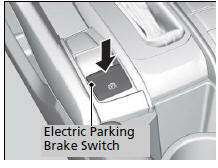 Pull the electric parking brake switch up gently and securely. ► The parking brake indicator comes on. The vehicle must be ON (w*1 in order to release the electric parking brake. Press the electric parking brake switch. ► The parking brake indicator goes off. Manually releasing the parking brake using the switch helps your vehicle start slowly and smoothly when facing down hill on steep hills. You may hear the electric parking brake system operating from the rear wheel area when you apply or release the parking brake. This is normal. The brake pedal may slightly move due to the electric parking brake system operation when you apply or release the parking brake. This is normal. You cannot apply or release the parking brake if the battery goes dead. If you pull up and hold the electric parking brake switch while driving, the brakes on all four wheels are applied by the VSA system until the vehicle come to a stop. 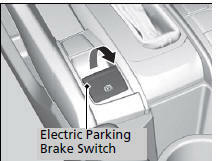 The electric parking brake then applies, and the switch should be released. In the following situations, the parking brake automatically operates. When the vehicle stops with the automatic brake hold system activated for more than 10 minutes. When the driver's seat belt is unfastened while your vehicle is stopped and the brake hold system is applied. When the engine is turned off while the brake hold system is applied. When there is a problem with the brake hold system while brake hold is applied. When the vehicle is stops more than 10 minutes while ACC with LSF is activated. When the driver's seat belt is unfastened while your vehicle is stopped automatically by ACC with LSF. When the engine is turned off while ACC with LSF is activated. When there is a problem with the electric parking brake switch, after you turn the ignition switch to LOCK 0*1. Use the accelerator pedal to release the parking brake when you are starting the vehicle facing uphill, or in a traffic jam. Depressing the accelerator pedal releases the parking brake. 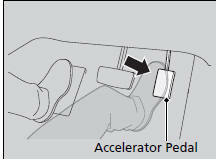 Depress the accelerator pedal while releasing the clutch pedal releases the parking brake. Gently depress the accelerator pedal. Gently depress the accelerator pedal and release the clutch pedal. If the parking brake cannot be released automatically, release it manually. When the vehicle is travelling uphill, the accelerator pedal may need to be pressed farther to automatically release the electric parking brake. 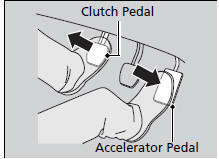 The clutch pedal is fully depressed before gently depress the accelerator pedal and release the clutch pedal. You are wearing the driver's seat belt. The transmission is not in P or N.
The transmission is not in N.